Dual-power pocket calculator features a large 8-digit, liquid crystal display (LCD); extra-large plus key; and hard cover. Function includes three-key memory; tax keys; PC touch keys; and percent. 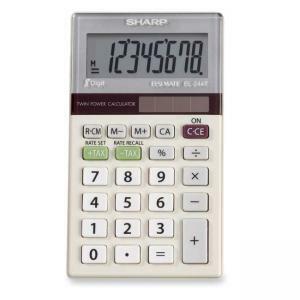 Calculator automatically switches off and runs on battery and solar power.